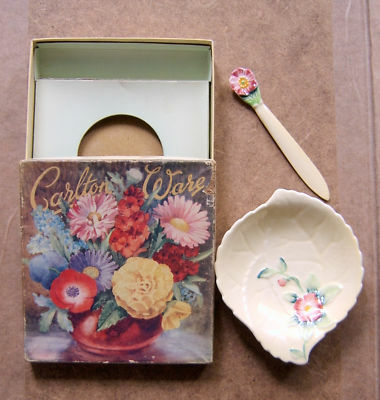 This is a rare opportunity to acquire a BOXED highly collectable and immaculate CARLTON WARE Butter Dish and Knife in their usual lightish green background with a Wild Rose Design . The dish is an Australian design from the 1938/1939 period with the flower design featuring on both the dish and the knife. The impressed mark is 2114 on the underside. The dish measures 4 inches (10 cms) in diameter. The knife is 5 inches (13 cms) in length. There are no chips/nibbles etc to either piece with just a trace of crazing to both pieces. The original box is in excellent condition.